Liposuction, also known as lipoplasty, liposculpture, suction lipectomy or lipo, is a minimally invasive cosmetic surgical procedure that removes excess fat from a localized area of the body with a thin, hollow tube known as a cannula. Liposuction is not a substitute for losing weight and exercising. It is not effective in eliminating cellulite or tightening loose and sagging skin. The cannula is inserted through incisions made in areas of the body and is moved to loosen excess fat and suction it using a vacuum or a cannula-attached syringe. The areas of the body that have been treated will appear slimmer and contoured. Candidates for liposuction should be in good overall health and have one or more areas of fat that do not respond well to diet or exercise. Liposuction is used to target areas on the thighs, abdomen, arms, back, hips, buttocks, flanks, chest, face, calves and ankles. Liposuction can be performed alone, or in with other surgical procedures, such as ​abdominoplasty. After the liposuction procedure and before transferring to the recovery room, the patient will be placed in a compression garment that was custom ordered for the patient prior to the procedure. The patient is typically discharged from the recovery room an hour after the procedure. The patient will be monitored in the recovery room. Vital signs will be checked, including blood pressure and oxygen levels. The patient will be observed for signs of nausea or dizziness. Dark towels to place on the seat you will sit on to absorb any leaking fluids. During the next 24 hours, there will be a discharge of fluid from the tiny incisions made in the body for the procedure. This is normal and should be no cause for alarm. 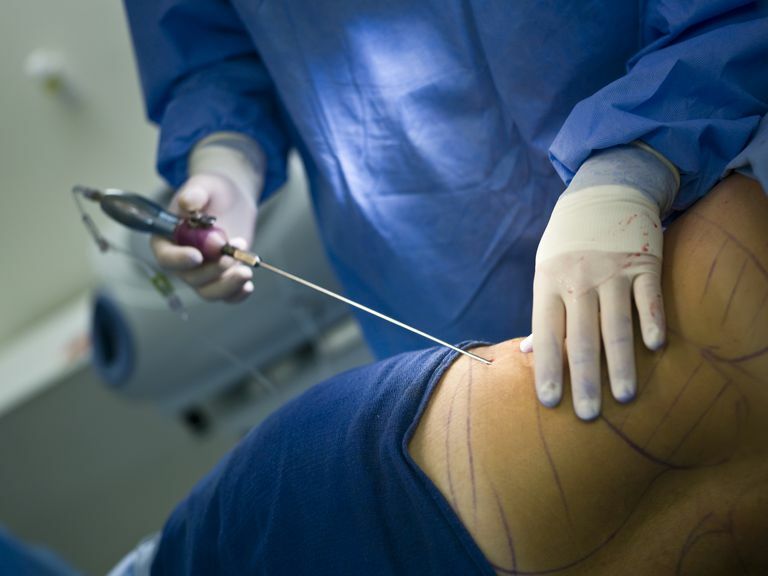 The patient will feel sore and bruised for a few days after the liposuction procedure. For the first five days after the procedure, the patient will need to keep the compression garment on, rest, drink fluids, and not shower or bathe. Patients should move every two hours to prevent the formation of blood clots. This will also help to keep fluids moving in the body and reduce swelling. On the fifth day, the patient will return to the office for a post-operative visit. The compression garment will be removed so the patient can be examined. For the next ten days, the garment will need to be worn 24 hours a day and removed only for showering. The patient will be able to lightly exercise by walking or stretching. The patient may return to work the second week after the procedure. During the third and fourth weeks after the procedure, the garment may be worn for 12 hours a day. At the fourth week, normal activities and exercising can resume. It can take several months for the swelling to resolve and the results of the liposuction are completely revealed.